Carlos Sainz has signed a multi-year deal to replace Fernando Alonso at McLaren from the 2019 season, the team have confirmed. 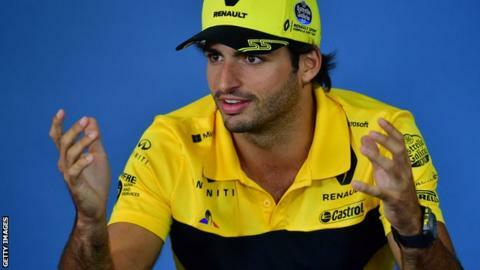 Fellow Spaniard Sainz, 23, is currently on loan at Renault from Red Bull and said it was a "childhood dream" to join McLaren. "I've been a McLaren fan for as long as I can remember," he added. "It's a great name in the sport with an incredible heritage, and the list of drivers that have raced for McLaren over the years are among the heroes of Formula 1. McLaren Racing chief executive Zak Brown said Sainz, who began his F1 career with Toro Rosso, provided "the perfect blend of youth and experience". "We're incredibly excited to have Carlos join us as a McLaren driver," added Brown. "We've been assessing him for some time now and rate him very highly among the next generation of young talent emerging through the ranks in Formula 1." After the Hungarian Grand Prix, Sainz sits 11th in the drivers' championship standings with 30 points, with his best race finish fourth in Singapore while racing for Toro Rosso in 2017. McLaren's other driver is currently Belgian Stoffel Vandoorne. Who do you want as the next Red Bull driver? Read more on Vandoorne? Gasly? Raikkonen? Who do you want as the next Red Bull driver?